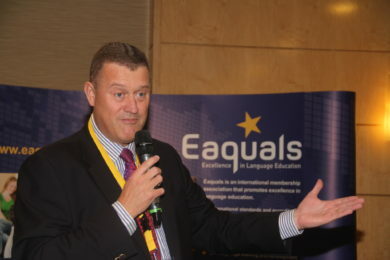 The Eaquals Annual International Conference provides an opportunity to exchange expertise and examples of best practice with an audience of language education professionals from over 30 countries. Members and non-members of our Association will attend and delegates will include academic managers, language teachers and business directors along with specialists from international education organisations. Play a direct role in our programme by becoming a speaker in 2018. We are looking for practical topics and case studies that will actively engage participants. We encourage proposals that are jointly delivered by representatives of 2 or more Eaquals member institutions, working in different contexts and/or teaching different languages. These will be delivered as breakout sessions for up to a maximum of 50 participants. Presentations will be delivered in 30-minute slots. Your presentation should take no more than 20-minutes and you should allow 5 minutes at the end for a question and answer session or discussion. Workshops must be interactive and may be a forum for sharing expertise between participants. They will be delivered in 60-minute slots. Please complete the online form by clicking on “Submit your proposal” below. You will be asked to choose a short title for your session, and provide an abstract, accurately describing the aims and contents of your workshop or presentation and explaining how it meets the selection criteria above. The Conference Programme Committee will use the criteria in the selection process so make sure it meets our requirements. Abstracts of selected proposals will appear in the conference programme. Alternatively, you can download this form and send the completed proposal to the Eaquals Secretariat at info@eaquals.org by 30th September 2017. The Programme Committee will confirm whether your proposal has been accepted by 1st November 2017. Presentations and workshops will be scheduled between 1330 on Friday 27th April and 1700 on Saturday 28th of April. In submitting your proposal, you commit to being available between these times.